California State Northridge Sports Medicine celebrated NATM by posting a “Fact of the Day” in the athletic training center to educate athletes and visitors to the facility. 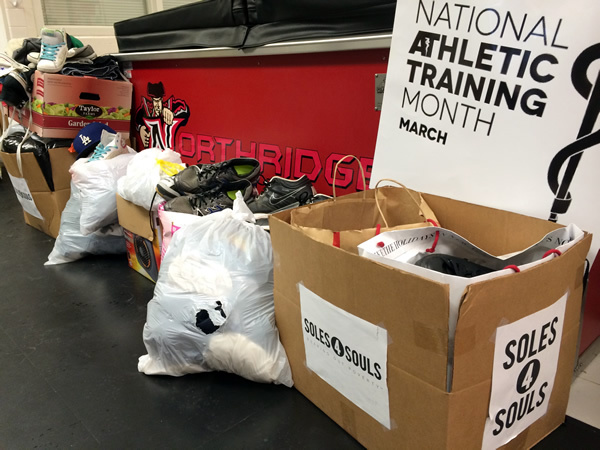 In addition to increasing awareness, the sports medicine staff teamed up with the CSUN Sport Clubs athletic training staff to host a shoe and clothing drive through Soles4Souls. Soles4Souls is a non-profit organization dedicated to eliminating poverty in disadvantaged communities both in the US and overseas. The team collected over 50 pairs of shoes and an abundance of clothing donations for the cause. In all, it was a very happy National Athletic Training Month at CSUN!